Ta-Nehisi Coates hit the nail on the head when he said, “Comics are so often seen as the province of white geeky nerds. But, more broadly, comics are the literature of outcasts, of pariahs, of Jews, of gays, of blacks. It’s really no mistake that we saw ourselves in Doom, Magneto or Rogue.” Since their inception, comic books have been a place for fantasy, wish fulfillment and political commentary. Much like science fiction, a genre decades old by the time comic books became popular in the United States, comic books often reflected the fringes of American society. They told the stories of outcasts and aliens, people who didn’t step in time with the rest of humanity. It’s unsurprising that someone like William Moulton Marston, psychologist and creator of Wonder Woman, would find himself so drawn to the medium. Front page to The Sound of Her Wings from Sandman: Preludes & Nocturnes, Issue 8, 1991. Marston wrote this for a 1943 issue of The American Scholar, a year after Wonder Woman debuted in her first solo book, Sensation Comics. He was a blacklisted psychologist who lived in a polyamorous relationship with two women, Olive Byrne and Elizabeth Holloway. All three worked, wrote and helped raise their four children. A self-identified feminist, Marston infused Wonder Woman with his politics, hoping to create a new feminine ideal. Perhaps, then, it is even less surprising that Marston’s inspiration was found largely in the radical communities of Greenwich Village. Wonder Woman was not the only superhero to have passed through the Village. Comic book writers and artists have been sending their characters to the quintessential home of radical counterculture for decades. Wonder Woman herself lived in the Village in the sixties and seventies. Madame Xanadu, a sorceress based on the Arthurian legend of Nimue, had her salon on Chrystie Street. Peter Parker, that most relatable of high school geeks and New York native, swung through the Village regularly. Kyle Radnor, one of the iterations of the Green Lantern, was an artist whose studio was in a Greenwich Village loft. It made sense to place these characters here. Like the folk music that permeated the Village in the 1950’s and 60’s, comic books told stories that were always meant for the common person, but also for those who didn’t quite feel like they were in sync with the rest of the world. People found shelter in the Village, and it was no different on the pages of Spider-Man or Wonder Woman. 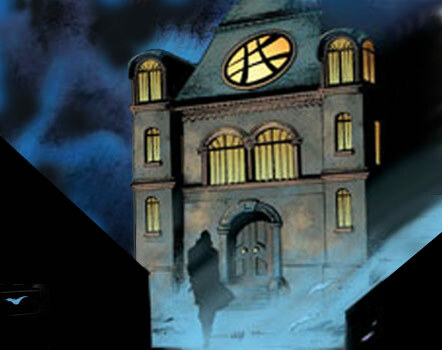 A shadowy figure approaches the Sanctum Sanctorum, home of Doctor Stephen Strange, which first appeared in Strange Tales, issue 116, 1951. The Sanctum existed in multiple dimensions, but the front door was on Bleecker Street. Outside comic books, Greenwich Village was home to people like socialist writer Max Eastman, who published Child of the Amazons and Other Poems in 1913. Charlotte Perkins Gilman published Herland, a utopian novel about an egalitarian world without men, in her magazine Forerunner in 1915. Clearly Amazonian society had been on the minds of many Village feminists, not just Martson’s. Because of their format, and their intended audiences, comic book creators had room to do the daring, to challenge social mores. Sometimes they didn’t succeed, and often they ended up just reproducing the same prejudices they were attempting to subvert. Despite the efforts of people like Marston, the comic book industry has been dominated by white men, its path dictated by what they think their audience of white teenage males want to see. 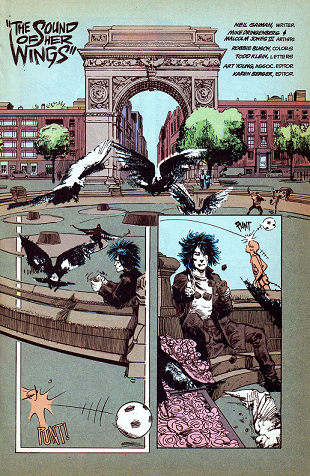 But comic books still have their roots in counterculture, and are so identified with bohemian Greenwich Village that author Michael Chabon set much of his novel, The Amazing Adventures of Kavalier and Clay, there. His characters, Joe, Sammy and Rosa, called the Village home, often finding refuge there through a storm of homophobia, sexism and anti-semitism. Comic books have certainly changed over the years, and so has the Village, but their shared history continues to draw people for similar reasons. They have the ability to show us our fantasies and desires, reflecting them back to us for better or worse. Idealists, radicals, outcasts and sometimes just lonely kids looking for companionship – those are the people who still hold comic books closest, and comic book creators owe much of that to the influence of the Village. Gaiman, Neil. Sandman: Preludes & Nocturnes. New York: DC Comics, 1991. Chabon, Michael. The Amazing Adventures of Kavalier and Clay. New York: Random House Publishing, 2000. Daniels, Les. Wonder Woman: The Life and Times of the Amazon Princess: The Complete Story. San Francisco: Titan Books, 2000. Schwartz, Judith. Radical Feminists of Heterodoxy: Greenwich Village 1912-1940. Norwich, Vermont: New Victoria Publishers, 1986. Greenwich Village became widely identified as America’s bohemia by the mid-1910s. The radicals who lived in Greenwich Village in the early 20th century rejected traditional structured socialization, preferring instead bohemian informality. Yet they often met in Village hangouts to discuss their ideas about revolution and art. These places, and the individuals that frequented them, earned the Village its reputation as America’s Left Bank and attracted tourists and those who wanted to live the bohemian lifestyle. And look my fill into the sky. The sky was not so very tall. And — sure enough! — I see the top! I ‘most could touch it with my hand! I screamed to feel it touch the sky. 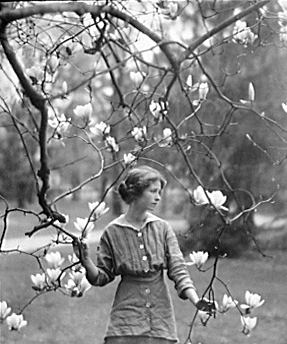 American poet Edna St. Vincent Millay was born on February 22, 1892 in Rockland, Maine. When Millay was eight years old her parents separated. She was raised by her mother, Cora Millay, who influenced her interest in literature and poetry. In her twenties she attended Vassar, funded by a benefactor, before moving to New York City. Millay lived in Greenwich Village in the years following 1917 and was part of the same social circle as Theodore Dreiser. Millay was one of the most popular poets of her time and in 1923 won the Pulitzer Prize for Poetry. Millay’s personality and the themes she explored in her poetry personified the spirit of America’s Bohemia. The nymph of Greenwich Village, she defied convention and was determined to discover and declare a distinct identity for herself. The theme of social and artistic revival that characterized the Bohemian Village can be seen in Millay’s poem “Renascence,” which she wrote at the age of 19. It was first published as a contest winner in the 1912 anthology The Lyric Year and became the centerpiece of Millay’s first collection, Renascence and Other Poems in 1917. Her second volume of poetry, A Few Figs from Thistles, was published in 1920. This collection includes the poem “Macdougal Street.” Shortly thereafter the collections Second April (1921) and The Ballad of the Harp Weaver (1922) were published. Later volumes include The Buck in the Snow (1928), Fatal Interview (1931), and Wine from These Grapes (1934). In addition to being a poet, Millay was a playwright. Her productions all took the form of poetry. Her most popular play, Aria de Capo, debuted in 1919 with a performance by the Provincetown Players. Through this play, written shortly after World War I, Millay expressed her pacifist stance. The Provincetown Players, like Village troupes the Washington Square Players and the Theatre Guild, initiated and developed America’s “new theater.” Two years later, the Provincetown Players performed Millay’s Two Slatterns and a King. Before writing several plays, Millay acted for the first time with the Provincetown Players in Floyd Dell’s The Angel Intrudes. Along with her poetry, Millay was famous for her activism and her bohemian, unconventional lifestyle. Though some of Millay’s earlier works, such as Aria de Capo, contain political themes, her work became increasingly political as she got older. Additionally, she became involved in contemporary issues such as the Sacco-Vanzetti case in 1927. Her many love affairs during the period in which she lived in the Village included Dell and the poets Arthur Davison Ficke and Witter Bynner. In 1923 she married Eugen Jan Boissevain. Together they bought their home “Steepletop” in Austerlitz, NY, where Millay died at the age of 58. This week is banned books week, an annual event highlighting the value of free and open access to information. 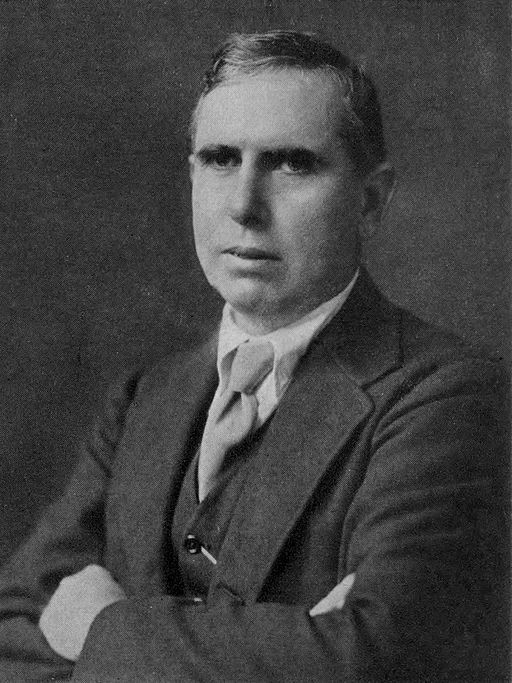 Resident of Greenwich Village and novelist Theodore Dreiser dealt with censorship with several of his books, including his most famous: Sister Carrie (1900) and An American Tragedy (1925). Dreiser’s writing was part of the literary movement naturalism, which was a grittier form of realism. Its defining characteristic is its portrayal of people as passive victims of natural forces and their social environment. Dreiser was born on August 17, 1871, in Terre Haute, Indiana. While he was growing up, his poverty-stricken family frequently moved between small towns in Indiana and Chicago. He studied at Indiana University, Bloomington for the 1889-1890 academic year before dropping out to become a journalist. Dreiser first inhabited Greenwich Village in 1894, as a resident in a dingy hotel on Bleecker Street. The next two years saw him return to the Village for brief stays as he traveled widely as a journalist and novelist. Dreiser finally settled down in the Village in 1914 when he moved into an apartment at 165 West 10th Street. In the first few decades of the 20th century, Greenwich Village started to attract a “new type” of resident. This included artists, journalists, and professional people. Thus the Village in this period had thriving literary, artistic, and radical scenes. These early Village residents made up a relatively tight-knit group. They hung out together, criticized each other’s writing, and felt a common bond keeping them together against the outside world. This literary scene and Greenwich Village institutions were a major part of Dreiser’s life and work while he lived there. During the day he would walk in Washington Square Park and browse in the 8th Street Bookshop. In the evenings he would attend the productions of local theater companies. His mistress, Kirah Markham, often performed with the Provincetown Playerrs. The Washington Square Players performed some of Dreiser’s plays. Floyd Dell, Max Eastman, Sinclair Lewis, Margaret Sanger, Hutch Hapgood, and Emma Goldman are just some of the names that made up Dreiser’s New York social circle. Many of Dreiser’s novels were composed at least partly in New York. Sister Carrie, a novel about a young woman from a small town who moves to Chicago. In the big city, she pursues the American Dream by becoming a mistress to men and then an actress. However, Doubleday, its publisher, limited the novel’s advertising because the central character’s “morality” goes unpunished. Consequently, not many copies of the book sold. In 1916, the New York Society for the Suppression of Vice forced Dreiser’s newly published novel The Genius off the market for being blasphemous and obscene. Dreiser’s friends in Greenwich Village signed the many petitions that he circulated in his campaign against the Society. The 1925 publication of An American Tragedy, about a murder case, brought Dreiser his greatest critical and commercial success. Dreiser died on December 28, 1945, at the age of 74, in Hollywood, California. In history books, the name Mabel Dodge is often subsumed by those of the more prominent Greenwich Village bohemians like Max Eastman, Emma Goldman, Carl Van Vechten, Margaret Sanger and Alfred Stieglitz. Yet behind all of these artists and revolutionaries was Mabel. A wealthy heiress with an obsession to prove her worth, Mabel provided the bohemians with the elements necessary to maintain their lifestyle: consistent patronage and a space to congregate. She transformed her apartment at 23 Fifth Avenue into a social salon where more than a hundred people would gather weekly to socialize, debate, and promote their work. Without a doubt, the Village bohemians of the 1910s needed a character like Mabel Dodge… almost as much as she needed them.